There’s something properly luxurious about scent that is carried not by alcohol but by oil. The silkiness of the texture and how it melts into the skin are so much more tangible than a traditional spritz application – and all the more captivating for it. It’s the bohemian mood that it puts us in. From a beauty perspective, we have been living in the age of oil for some time, but now perfume oils are also catching on as a home fragrance. Here is our pick of scented oils to bring stylish seduction to your skin or space. 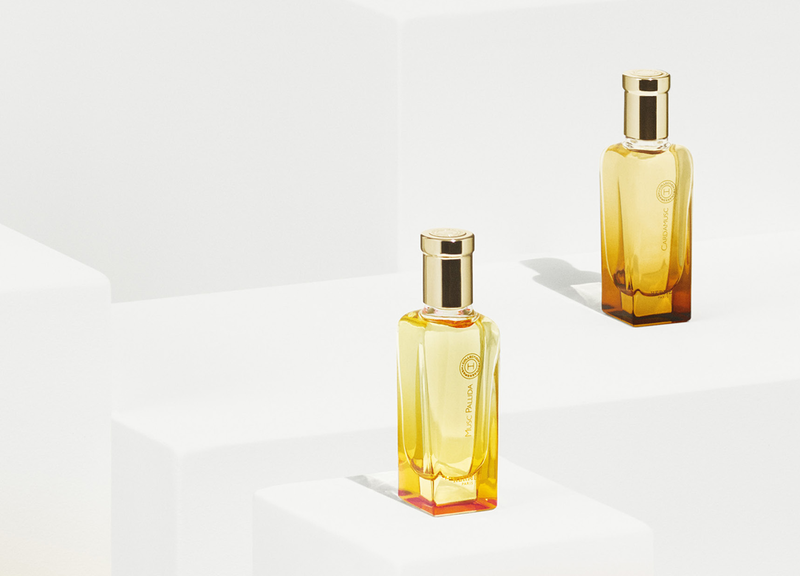 We start with Swiss-Italian perfumer Christine Nagel, the resident nose at French luxury label Hermès since 2016, who has introduced perfume oils to the house for the very first time as part of the latest additions to the ‘Hermessence’ range. Of her five-strong Orient-inspired and layerable collection, there are two totally dreamy oil-based scents: ‘Cardamusc’ and ‘Musc Pallida’. The first is laced with fresh but spicy cardamom, the other with sensual iris. ‘I wanted to return to the origins of perfumery and immerse myself in its history,’ says Nagel of the liquid gold creations that slowly pour from similarly molten, amber glass bottles. Recognised for its beautiful stores, Australian skincare brand Aesop has now introduced some interiors magic to the collection. Its first Aesop Home piece, the sculptural ‘Brass Oil Burner’ was designed by Sydney-based Studio Henry Wilson, who was behind the decor of a couple of Aesop’s stores (Balmain and Crows Nest in Sydney), as well as a 2017 exhibition at Milan’s Brera showroom. Formed with an ancient wax-mould technique used to cast its solid brass shape, this weighty, one-kilogram vessel teams Aesop’s streamlined design aesthetic with functionality to disperse tailor-made essential oils. A cradle for the oil, this glowing chunk of metal was chosen not only for its looks but also for its superior heat transfer properties, tactility and warm affiliation with candle light. Just add five to 10 drops of your preferred oil blend to the oil well – choose between floral citrus ‘Anouk’, spicy citrus ‘Catherine’, minty ‘Isabelle’ or woody citrus ‘Béatrice’ – alongside a standard tea light. It doesn’t get any simpler or more appealing. Blending wanderlust-inspired concoctions, Australian fragrance and candle brand Lumira specialises in olfactory escapism with each scent a tribute to a global adventure. Founded by Sydneysider Almira Armstrong in 2013, the label follows a lifelong love of fragrance. Her tempting range of five perfume oils includes a Persian rose-scented roll-on, which combines top notes of bergamot with a dark amber base. We like. Expanding into perfume oils from candles, Frederick Bouchardy of New York label Joya loves the intimate, bespoke quality of an oil-based fragrance that changes significantly according to the wearer’s body chemistry. Handmade and poured in the Brooklyn studio, Joya’s essential oil blends come in travel roll-ons – but from a design point of view, we’re most excited about the slip cast porcelain bottles made by US ceramic artist Sarah Cihat. Did anyone mention the 22-carat gold-dipped wands? A very nice finishing touch.